Question: How are the Zatoichi and Lone Wolf and Cub series related? Answer: Well, the films aren't related, but their stars are. Shintaro Katsu (Mr. Zatoichi) and Tomisaburo Wakayama (Mr. Lone Wolf) are brothers. 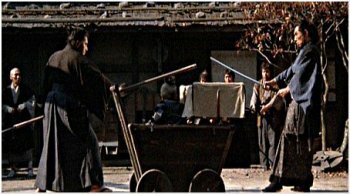 Also known as the "Baby cart" films, the Lone Wolf and Cub films follow a ronin as he travels through the Japanese countryside with his young son in a baby cart. (A sometimes deadly cart full of its own weaponry and surprises.) The episodes are quite violent (much more so than the Zatoichi films) and also contain some sexually explicit subject matter. If you're ready for a change of pace, check out the Lone Wolf and Cub series. These DVDs are presented in their widescreen, theatrical aspect ratios. The English subtitles are displayed over black bar backgrounds so the full theatrical image is presented without distraction. And all are new, uncut, and unedited. Who are "The Lone Wolf and Cub?" He was Ogami Itto, a man who held himself to the harsh code of bushido (code of duty, code of honor), entrusted by the Shogun with the gravest of responsibilities, that of official executioner. His flashing blade brought swift release to those ordered to commit seppuku (ritual suicide), be they man, woman, or even child. Now he is a wandering assassin, stripped of all his lands and titles. All he has left is his son, Daigoro, his two swords, and the burning desire to exact revenge upon the evil Yagyu, who murdered his wife and framed him for heresy. He is no longer Ogami Itto -- he is the assassin they call "The Lone Wolf and Cub." All six of the LW&C episodes in a special collector's box. Betrayed by Yagyu, Ogami Itto and his son begin their bloody journey towards revenge. 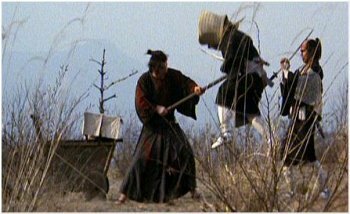 Their first commission: to save the life of a daimyo (land owner and feudal lord) and kill the traitors that plot his death. The evil Yagyu sets a band of deadly female ninja on Ogami's trail. Meanwhile, Ogami must kill a traitor who seeks to sell a clan's secrets to the shogun -- a traitor guarded by three men known as "The Gods of Death." After undergoing torture to demonstrate his honor and buy the freedom of a girl about to be forced into a life of prostitution, Ogami is hired by his very-impressed torturers to kill a corrupt governor. Ogami is hired to kill a tattooed female assassin, but the job is not as straightforward as it seems. Five warriors challenge Ogami to duels. Each has 1/5 of the usual fee, and 1/5 of the information needed to complete the new assignment. Ogami has to be skillful enough to not only kill them, but also find out what each man knows. The final film and the final confrontation between Ogami and Yagyu Restudo. With most of his family already dead at Ogami's hands, Retsudo launches one last plot to destroy him. Click here to visit our Samurai auxiliary site.